Had an enjoyable day cycling to Wrest Park today and doing a little bit of sketching on the iPad. 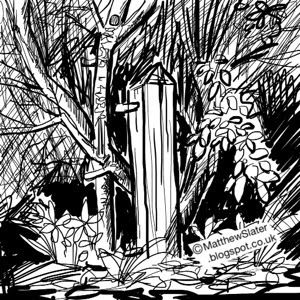 Here is an old gate post almost hidden amongst some blackthorn bushes and a couple of sketches made in the cafe. 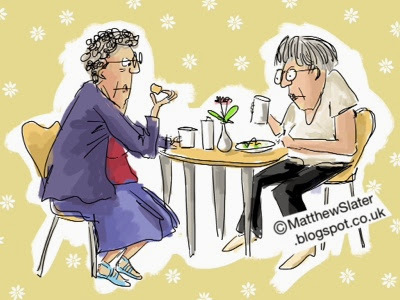 A wet Bank Holiday Monday found me having coffee in a certain department store cafe. This scene of two girls and a double buggy caught my eye. 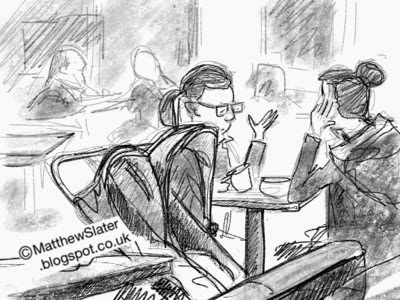 I thought they looked quite bedded down for a while so I scribbled away on the iPad and and at one stage got so focused on some detail that I failed to see them get up and go. When I next looked up they had gone and I had to fill in the other half of the sketch by guesswork. I am finding that sketching with my sketchpad is currently more enjoyable, but I am trying to keep setting myself challenges on the iPad. 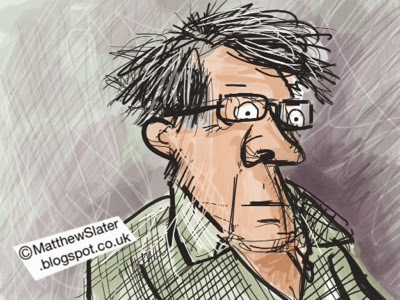 One advantage of working on the iPad is that people can't so easily see what you are doing! 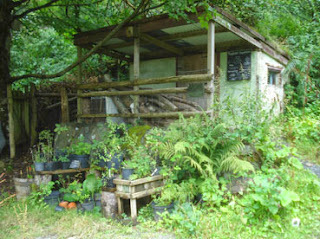 This [the shed] is a place of peace and the rain is pouring down outside quite heavily. I am sure it is not just a shower and a strong breeze flows through the garden. It all sounds beautiful [a word that I am dwelling on quite a bit in my thoughts] and the rain is getting heavier and the sound louder. My thoughts are almost becoming drowned out by the torrential downpour and the breeze blowing in through the open door carries smell of damp earth and vegetation. And I just want to write about this beautiful place as the rain thunders down. I remember being up on a hill near Leintwardine sheltering in some old isolated farm buildings during a rain storm. I was outside - but in a place of shelter. Somewhere where I could experience the elements of nature and have my senses awakened to the weather but yet be out of the wind and in the dry. There are many times when I have enjoyed sitting in the car either at lunchtime or when out and about and and it has rained. The sound of rain is all dimensional - all around me - almost comforting as if I am in a womb of safety. I have never thought back to how I might have felt in my mother’s womb before. Of course, I don’t consciously remember it but there must be some vestigial sub-conscious recollection of those formative first nine months of my life. It must have been an odd feeling to be surrounded by water, not breathing, but yet to be alive. It is amazing how we start off our lives surrounded by water yet as soon we are born that environment can be deadly to us as well as water being vital for the continuation of life. My future lies in the outside rain, in the seasons, but at the moment I just listen to the rain - the sound of it on the roof, dripping off plants and flowing in the gutters. Here I am in the dry - sheltering from the outside elements - like a baby in a womb. The first morning of bright sunshine since we arrived by the river nearly a week ago finds me walking across heavily dew-laden grass down to the river bank. I've not often stayed for a lengthy of time by a river and the constant background tumbling of water over rounded stones is something that has taken a while to get used to. It is a sound that overrides some of the more subtle countryside voices and I am more used to tuning into stillness and silence. There is a constant energy to the flowing water that I am not sure I find relaxing. I have made many visits to the water's edge to try and understand the language of the river and see what it might teach me but I am not sure I have really bonded with the place. Today, the light is bright and the air fresh with summer coolness with the promise of a fine day ahead. As I approach the river I hear the distinctive song of a dipper. Subtle and tuneful, a constant warbling that seems to mimic and merge with the chattering from the river. It can't be far from me and I search along the bank whilst standing motionless. Then I spot the stark bright whiteness of the dippers bib - its dark body merges with the stone backdrop. It bobs around the rocks and then moves out into the shallows and feeds, half submerged in the water. Soon it is joined by a companion and eventually they fly off, skimming the surface of the water upstream. I look out again and see, about 400 yards downstream on the riverbank a tall slender white object standing in the sunshine. A heron. And then, I see something moving in the water just beyond that. I think it is an otter, but at that distance I am not sure. It certainly isn't the mink we saw here a few days ago. A hurriedly fetched daughter and a pair of binoculars reveals it is a duck, but I am not sure exactly what it is as it quickly disappears. Heron and daughter disappear too and I am left by myself with the river and dippers again. The river is a place where there are varied interactions between light and water. A few days ago I was down here in evening watching the sun set between the remains of rain clouds. The sky was full of various patches of pale orange whee the sun light was filtering through gaps in the heaven grey clouds. The river was flowing away from me directly in line with the sun and so this light was reflected in the ripples on the water. It looked beautiful and it felt a privilege to witness this combination of events. Each part of the river looks different depending on how it is observed. I. The shallows before me I can see through the trees to the pebbles about a foot below the water's surface. Elsewhere all the light is reflected off the surface to give a silvery shimmering where the water flows over the shallow rapids. Under the trees in the distance the water looks almost black. The river is an interesting place. It is always here and yet the water is always on the move and never in the same place again. It is always different. Its calm serenity can give way to viscous flooding. Even in the past few days with just a little rainfall I have observed the height rise and drop again. It is a place of continuous energy, power and change. 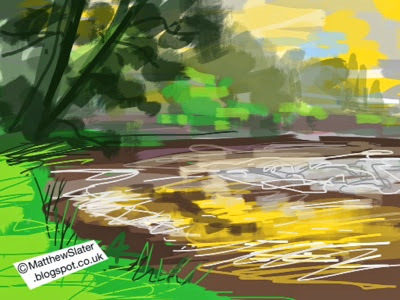 A very quick sketch made by the bank of a river near Dolgellau at sunset. The harbour made a pleasing place to sit for a while today and do some sketching. For a change I ignored the people around me and concentrated my attention on a pen and ink illustration of the sea-front buildings. A reasonably warm day had brought out the holiday makers who filled the pavements with their chatter, ice-creams and fish and chips. Sea-gulls eagerly pulled at discarded polystyrene food cartons in order to find any remaining scraps of food. The high street was a busy mix of traffic and people dipping curiously into the many varied shops, many of whom adorned the pavement or shop fronts with tantalising merchandise. As with most sea-side towns it was the shops selling the must-have cheap and cheerful beach wear, bucket and spades and toys that seemed to shout out loudest for attention. All the plastic in the brightest colours you could ever want could be bought there. Did I really want to walk past the shops and sidestep burger filled holiday makers for a third time that day? Instead I turned up a small path that lead between two shops and climbed the steep hill that rises sharply upwards behind the town. I entered a different world. Suddenly silence appeared and the hustle, bustle and smell of hot people and streets was gone. Before me was a maze of small paths and steps climbing steeply before me. 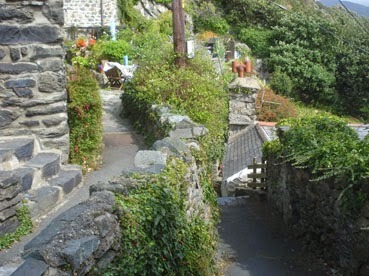 Slate steps worn smooth by generations of people, high walls that hid tiny gardens and houses that seemed to be tucked into any conceivable nook and cranny of the very steep hillside. There were no roads between the houses, just a maze of paths leading in varied directions. This was a place of angles, curves, twisty tight paths, unexpected corners, ivy covered walls, metal handrails and stunning views. I was surrounded by the architecture of old cottages, weaving stone walls, tumbling steps, rooftops, and chimney pots - all creating an amazing feast for an artists eye. Everywhere I looked, the greyness of the slate was broken up ivy, hydrangeas, and numerous other seaside loving plants. Colour from wild and garden flowers flecked the walls, gardens and paths. Following on from my previous post about the Centre for Alternative Technology, I made a conscious note of how much the people living here had changed the environment around their homes by adding pots and planters of flowers, garden furniture, driftwood, decorative features and so much more to brighten up the small spaces that were theirs. We have a deep need, wherever possible, to bring nature and/or something aesthetically pleasing into our lives. We seem to want to make some sort of statement - for ourselves and that can be appreciated by other people. I wonder why we do this? Is it that we are attempting to create something we find beautiful? To satisfy a need for fulfilling a positive emotion? Down in the town there was the need to seek gratification for our consumerist and social desire for food, shopping and holiday pleasures. Yet just a few yards away was a world that reminded me of the deep connection that the history of the place has with the landscape. There was the slate industry that created much of this landscape; the steepness of the hill side and the precarious nature of building on the steep hillside reflected the harsh climate, the ruggedness of the people and a community full of history. Looking down at the buildings below me there were many more modern buildings that looked so out of place amidst the traditional architecture that if I were a planner I would not have allowed them to be built nowadays. Not many people would venture up these steps as I did today, but I just took a 'what if' step and it changed the whole view of my visit to the town. A recent visit to this place left me very inspired. Although I was interested in the place scientific and sustainability point of view I came away from the place with ideas that were very much in keeping with the way my illustration work is developing. I have been intrigued by the concept of beauty recently and have just begun reading 'Timeless Beauty' John Lane which I purchased at the above place. At CAT my attention was drawn to the great amount of wood that was used in the construction of various buildings as well as for decorative architectural use, sculptures, fencing, garden features etc. It was a good reminder of just how versatile the material is for construction purposes from plant holders to high tech modern building design. I was also interested to see how plants were integrated into the environment either in the organic gardens, the poly tunnels, the forest garden or just wherever they happened to grow. Everything that was growing seemed healthy, lush and full of life and colour. I found the place quite beautiful and I wondered what it was exactly that I was picking up that caught my attention. I like to see plants growing, yes, but somehow, when plants are growing in conjunction with other inanimate objects then the capacity to arouse a pleasurable response is greatly increased. 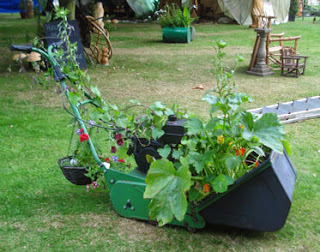 For example: a wheel barrow and a pot of flowers look fine on their own, but place the flowers in the wheelbarrow and have them all tumbling over the edge creates a visible impression on a different level. It is almost like the feeling one gets when seeing something young and cute perhaps. I'm not quite sure what it is, but it may be the juxtaposition of the natural against something that is often man-made, but not necessarily so. We like to grow plants in pots, over arches, to walls, in old boots, in fancy containers... There is just something about plants that they can so easily create a visual statement when grown in particular ways. At CAT there was so much that caught my eye. There were the structural forms that had been created out of natural resources blending in with the natural growth of vegetables, fruit flowers and wild plants. Nature will always try and reclaim back what was hers. We cannot live in isolation from nature. I could have spent many hours there drawing as I loved the wild lines, shapes and forms that had evolved in the place over the years. I took some photos to remind me of what I had seen and will feed some new concepts into my illustrations. 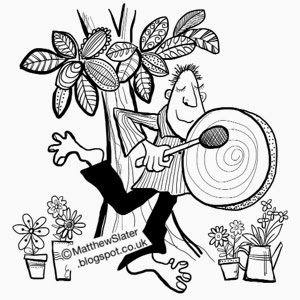 Following on from yesterday's blog where I joined a group of people at the start of the Rhythms of the World Festival in Hitchin to do a spot of drumming, this has now been drawn. To pray for goodwill and worldly peace. We join together; woman, man and child. In unity with drums our prayers released. This stunning piece of creativity caught my eye at the Rhythms of the World festival in Hitchin. It is an excellent example of horticulture being mixed with mechanical nostalgia and evokes in me all sorts of ideas and possibilities. I have occasionally broken out of 2-dimenasional limitations of illustration and ventured into the realm of garden sculptures but only with bits of wood and stone. I do have lots of possible bigger ideas floating around of what I could possibly do but I never spend the time, energy and resources in putting anything in practice. Mainly because it takes just that: time, energy and resources in sourcing materials etc. Perhaps this is now an inspiration to go out and do something constructive.